Wow, that was a phenomenally bad leap of logic from the parasitic practices inside the music industry, which I do not think you can deny is a thing, to flippant view of how business works. (You really need to discuss inventory turn over if you're going to throw out WalMart margins, or infrastructure costs for Exxon, as examples.) If record labels were just providing a necessary and valuable service to artists rather than exploiting them, successful artists wouldn't be rushing off to form the own labels the moment they were contractually able. Or are you actually suggesting that the record labels would give artists a bigger cut if we would just pay $1.99 for a song on iTunes? Because we've already seen that the labels feel fine giving artists nothing at all on digital sales if their contracts, which often predated digital, do not expressly provide for that. Not your best work, but I'll get over it. So successful artists can do their own thing. So the labels are 'exploiting' unsuccessful artists? Um, doesn't exactly sound like a licence to print money. I think you are ignoring risk. I suspect a lot of the money made by labels from successful artists goes to taking a punt on bands who only sell 4 CD's. Effectively they are investors in hundreds of business startups, 95% of which never make them any return. That's where much of the 63% goes. Anyway, if it's easy money, I guess you've set up your own label? His point is that everyone looks at Big Business and thinks "holy cow, those assholes are ROLLIN' in dough, they must be STEALING it all", and his point is that the money they make is a function of how titanically huge their business is and not because they're taking More Than Their Fair Share. Which is the usual complaint, although pointing out the facts doesn't solve anything. Some guy was insisting that Pfizer could sell everything cheap if only they weren't taking so much profit. I pointed out that Pfizer only makes about five percent profit and he replied "well yeah but they spend so much on marketing, they could sell everything cheap if only weren't spending so much money on advertising!" It's not about populism, it's about low-wealth people's jealousy of high-wealth people. I remember paying 99 cents for a single song when I was a kid. Of course that's about $8.50 in today's money. I was talking to a big liberal and they only thing they see is the magnitude of the profits, not the percentage. This individual even had a college degree. This is all true, but there's a separate aspect that bugs me more: making music is something that people do for fun. It's as much consumption as it is a job. I often encounter an assumption that people are born into doing a particular job, and that they're going to do that job their whole life. That is, some people are just musicians, and they are different from everyone else, and making music is the only possible way they could ever make money. It's a false assumption and a goofy perspective on life. I much prefer the view that we all make choices, both on what we are going to do today and what we are going to set ourselves up to do over the next ten years. Some of those choices will be more lucrative than others. Some of them--like making music--can make a little bit of money but usually not much. Some of them--like eating leftover pizza--are never going to make any money at all. I don't see what's wrong with that. Nobody was born to be a musician or a journalist or a dock worker or an electrician or a teacher or a leftover pizza eater. Those are choices we make, and some of those choices lead to a greater influx of cash. It's not wrong to choose something that will have poor earnings, so long as you are enjoying it. If you're not enjoying it, well, yeah, that would be a stupid life choice. Oil: Obtain drilling rights from landowners, governments, etc... Extract resources from deep within the earth using extremely expensive fixed-cost equipment in some of the most remote and challenging locations on Earth. Contract with thousands of service providers in furtherance of this effort. Transport it thousands of miles (or tens of thousands of miles), refine it multiple times, sell it at a market price that fluctuates wildly based on world economic and political considerations and is only vaguely related to the massive fixed costs of production. Music: Contract with artists to obtain the rights to their intellectual property. Except for a handful of world-famous artists, you have enormous leverage in negotiating these contracts. Front money for the production of new music, which is increasingly cheaper with new technology. Distribute said music, which nowadays has a marginal cost of practically $0. Withhold marketing dollars, because that's for big name artists. Try to recoup your investment. Cut royalty checks to artists based vaguely on the contract terms. That's not to say that anybody is specifically getting "ripped off" here, but rather that just looking at profit margins is fairly meaningless here. To put it another way, if the organized record industry disappeared tomorrow, we'd all still have music. If the oil industry disappeared, we'd all be dead pretty soon. 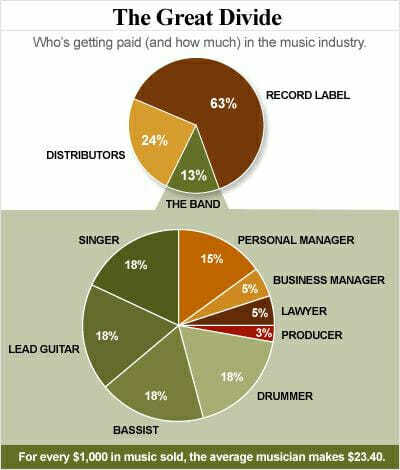 The point of this post is not that musicians don't make much money. The point is that when you consider payments as a percentage of business income, NEITHER DOES ANYONE ELSE. Record companies tend to sign their musicians when they first start out for very very long contracts. The musician is not an at will employee to the record company and can't get out of the deal. New artists usually sign deals that are so bad that they end up having to constantly tour to not starve. Note the deals for CD's is actually much better than the online songs. Musicians get even less from online, even though it costs less to produce, and distribute. Weird Al Yankovic is a decent example. He struck it big with his second album in about 1985. Just this year, he has released the last record/CD/set of music, under his obligation to the music studio. This some 30 years later. Musicians seem to be under a system similar to the studio system Hollywood had years ago where they would exclusively sign talent to their studio. It disappeared in the movie business, it should probably disappear in the music business as well. You're an idiot. We live in a police state with a higher prison population that most the rest of the world and you're worried about Exxonmobile and celebrities getting ripped off? We are talking about the tyrants of industry. F*ck artists for selling out to perpetuate our slavery for their empty success and false talent. F*ck ExxonMobile and every other energy company. We would be in a completely different world, moving toward new health and wholeness as a species if it wasn't for companies like exxon dominating our energy sources and POURING money into sabotaging human progression back to our natural autonomy and the use of discoveries like free energy. And all of this is made possible by idiots like you who must have skipped every lesson of science class teaching you the scientific method, b/c your critical thinking skills have developed even less than the morality of any of the above named parties. I hope you choke on your pen and are resuscitated by the smelliest homeless man in a 100 mile radius so you have to face every day knowing the people you look down your nose at are better creatures than whatever sorry excuse for a human being you are. if terrorism were as real a threat as they're pretending it is i wouldn't blame them for coming after us.